Eric Kelly doesn’t really believe in weeds. Or rather, he’s got radically different ideas about weeds than most people. As far as he’s concerned, almost every plant has value, either as food or medicine, or because it’s doing some kind of work in the soil. Clover, for example, which some people make great efforts to eradicate from their lawns, does an excellent job fixing nitrogen in the soil. Symbiotic bacteria take up nitrogen from the air, transfer it to the roots, and then leave it in the soil to nourish other plants. The flower and the leaves of purple clover, says Eric, are medicinal, as well. 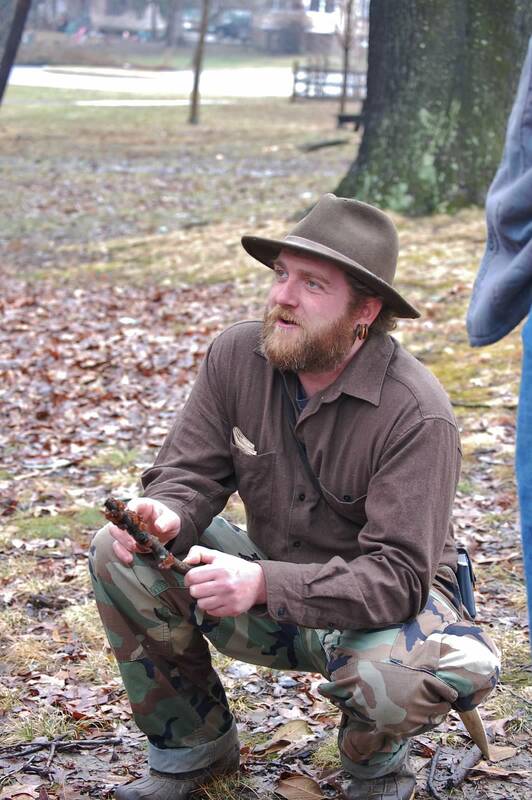 Also known as the “Mangy White Bushman,” Eric teaches Baltimore denizens how to find food in unexpected places. The founder of Charm City Farms, he runs foraging classes with his business partner, Victoria Greba, for adults and children who want to learn how to find the treasures hidden in plain sight. The classes, known as Wild Edibles Workshops, include instruction on recognizing edible mushrooms, plants for making tea, and more. 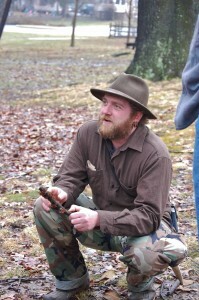 He helps his students recognize edibles from among any number of shoots, roots, stalks, berries, nuts, and seeds. 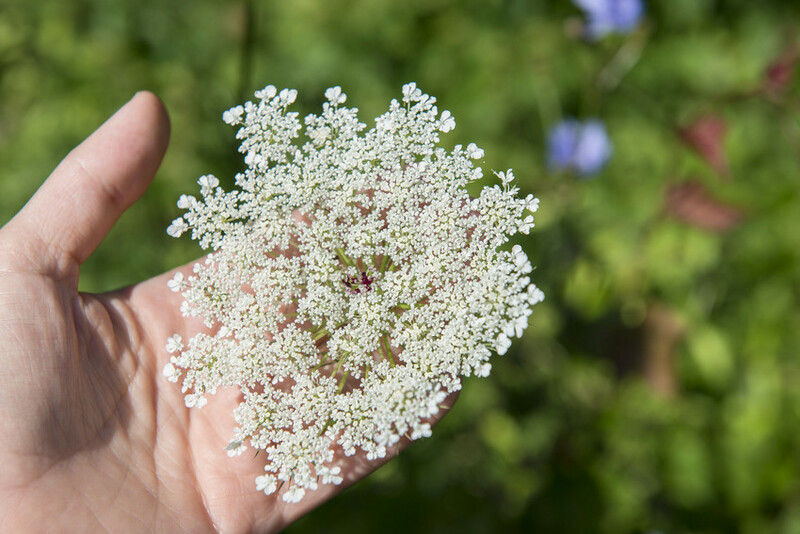 The roots of Queen Anne’s lace, a popular wild plant found growing in backyards and roadsides, are edible; they taste a little like carrots. 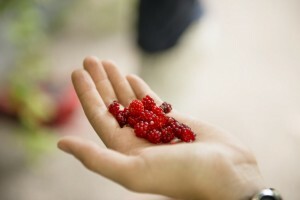 Wineberries, which look and taste like raspberries, are another easy-to-find urban delight. “People get surprised when a familiar plant turns out to be edible,” says Eric. Eric and Victoria have been a godsend to researchers doing a foraging study through The Johns Hopkins Center for a Livable Future and the U.S. Forest Service. They’ve connected urban foragers in Baltimore with the researchers; the researchers then conduct surveys for “Bountiful Baltimore,” a study of urban foraging in the city. The study aims to investigate where people forage in Baltimore, popular foraged species, potential risks from foraging in contaminated soils, and more. Colleen Synk, an investigator on the study, has identified from preliminary data what some of the most popularly foraged items in Baltimore are: chicken of the woods is a commonly foraged mushroom, while dandelions seem to be the most harvested plant, mainly for leaves and roots. The root tastes like horseradish, says Colleen. “I’ve been really impressed by foragers’ diversity of knowledge,” says Colleen, who has become quite a foraging expert herself. Bountiful Baltimore is actively recruiting survey participants for their foraging study. Eric and Victoria also do a lot coursework on permaculture and bushcraft, and in 2014, with the help of the Baltimore Orchard Project, they created Baltimore’s first “food forest,” located at Clifton Park. Images by Mike Milli, 2015, and Charm City Farms, 2015.